My philosophy to a healthy diet and exercise plan has always been to keep it simple. Eating whole, natural foods, in their most simple state is a rule of thumb I follow and recommend to everybody who asks me what they should do to start eating healthier. And as we all know, true health starts in the kitchen! So if true health starts in the kitchen- wouldn’t that mean that health really starts in your grocery store? Making the right choices in the grocery store is where it all starts, really! And steering clear of the processed snack cakes gets easier overtime, trust me. I know that it’s easier for someone who has been doing it for a long time like me but for those of you that may be new to eating healthy, or “clean,-” here are some of my best tips! Speaking of grocery stores- I was recently contacted to attend a blogger event hosted by Kroger with other bloggers in the area, which I attended today. And the icing on the cake? They gave me a swag bag and two $25 Kroger gift cards- one of which I’m giving away to you guys! Before I spill the giveaway details, I just want to talk a little bit about some of what they are doing to get healthier items in the stores, which we all can agree is super awesome. Speaking of keeping things simple- the Simple Truth line has always been one of my favorites! Offering items like Chia seeds, natural protein bars, and free-range, natural meats, including tons of gluten-free, wheat-free, and dairy-free items, they are great for anyone’s specific dietary needs. So awesome to see a bulk section like this, when we are so used to only seeing these in stores like Fresh Market or Whole Foods! All in all, it was a great time and I met some other super neat bloggers, too. I’m grateful to have been a part of it! And make sure to check out Kroger’s digital coupons for savings on these and other items as well. I had no idea they even had digital coupons for some reason, but NOW I DO and so do you. And that’s all you have to do to enter! I’ll be picking a winner at random a week from now, so stay tuned! 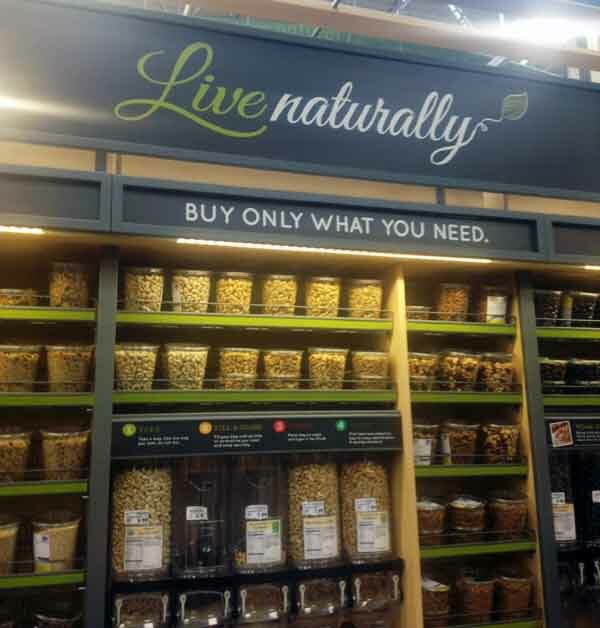 I would buy from the new organic nut selection to make my own trail mix- pumpkin seeds, almonds, cashews, peanuts, sunflower seeds, dried cranberries and dark chocolate chips- all organic! That is a super idea, actually! Yum! Oh I would spend it on FUN things! I would stock up on cereals! Cereals can get expensive, can’t they!? What’s your favorite kind? I actually haven’t eaten cereal in so long I’m not sure what is out there anymore! And I never consciously cut it out, I just tend to not eat it for some weird reason, haha. Yum! I agree! Wonderful choice. I’d treat myself to a rack of baby back ribs and BBQ sauce! Yum! What is your favorite kind of BBQ sauce? I’d buy expensive groceries – coconut oil, chia seeds, fancy nut butters, etc. Healthy luxuries are the best, aren’t they? 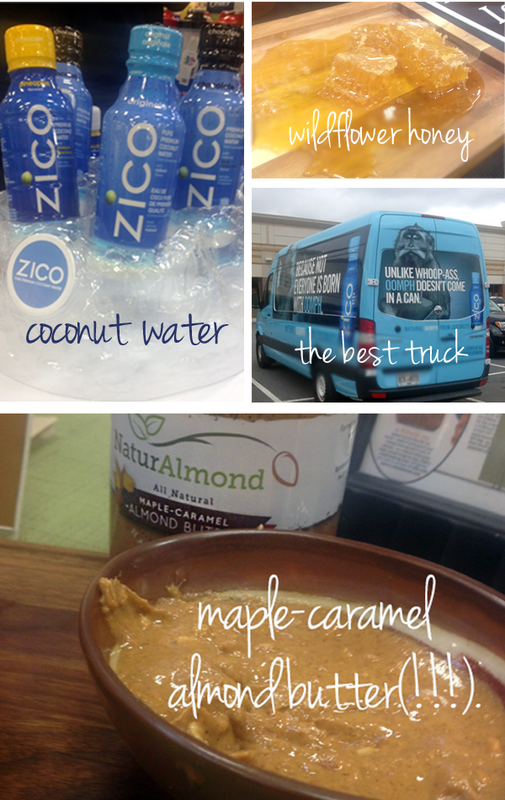 I would love to try almond and coconut butter! Also, I would buy some baking products to make cakes and bread. Yum! Yes, almond butter is amazing if you haven’t tried it! So rich! And I totally get that. It’s why I don’t actually bake all that much! Hey! 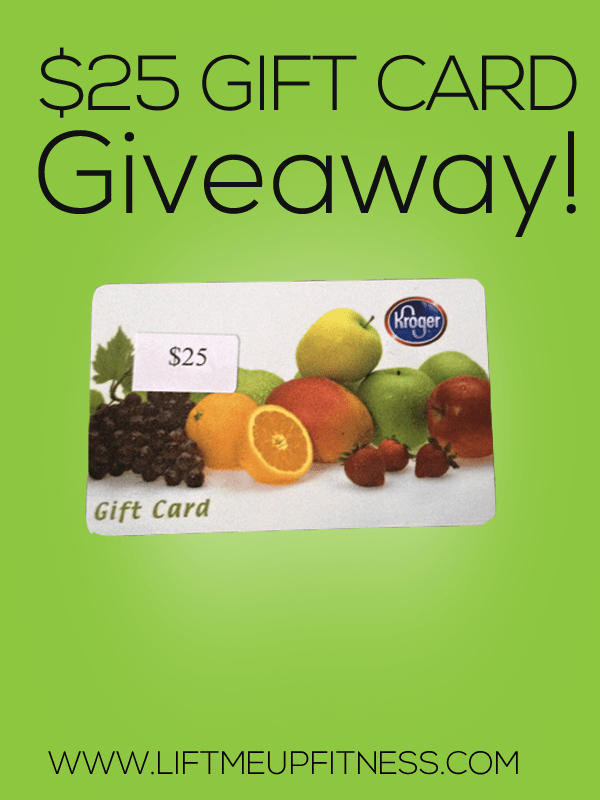 Just wanted to let you know you’re my random Kroger $25 gift card winner! E-mail me at LIFTmeupfitness@gmail.com with your address I can send it! Congrats! Well, seeing as springfield is FINALLY getting a kroger, I can’t wait to go there. if I won, I would spend it all on healthy food for me and my man! Yay! I love Kroger. Make sure to get a Kroger card so you can get fuel points! Hopefully yours has a gas station ($.30 off each gallon? Woo!) That’s one of my favorite parts, naturally. Oh I would definitely be doing some meat purchasing – quality protein is so expensive but so important in my book! I would buy some meat! That’s not always in my budget these days, and I do love an occasional pork chop or burger.